This restorative spray will gently soothe and balance the skin while deodorizing and conditioning the coat-leaving the skin soft, the coat supple and tangle free. Contains Aloe Vera (soothing and healing), Cactus Extract (moisturizes and conditions), Vitamins A & E (fortifies the coat and skin), Wheat Germ Oil (coat softener and conditioner). Keep pets smelling fresh and their coats soft and tangle-free with PPP AromaCare Sprays. 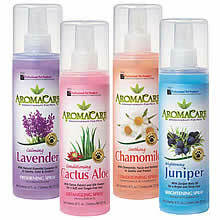 Choose from 4 varieties - Calming Lavender, Cactus Aloe, Juniper Brightening, and Soothing Chamomile and Oatmeal. Available in 8oz spray bottles. Keeps your pet just washed fresh between baths. Great for freshening up around the house, too. Gently soothes and balances the skin while deodorizing and conditioning the coat. Brightens white coats, as well as intensifies dark and mixed color coats. Gently conditions and fortifies the skin and coat preventing and eliminating tangles.